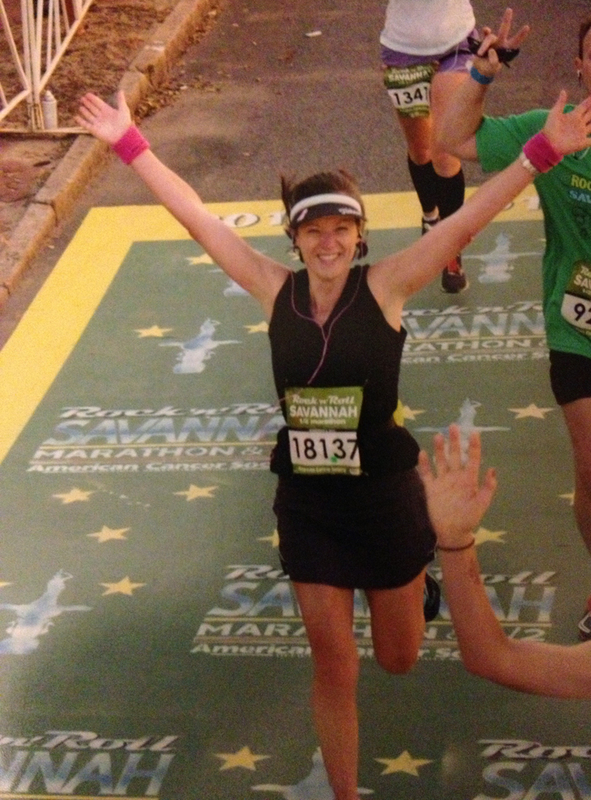 This guest post is the first in a series about runners and running. These guest posters are writing in an effort to encourage and inspire anyone considering running the Nashville Half Marathon in support of The Cupcake Kids. Tonight’s post is from Shelly Owens — a homeschooling mom of 5 littles. Shelly’s husband, Dan, is the President of SixtyFeet. I became a runner completely by accident. I really never meant for it to happen. I’ve always enjoyed a little moderate exercise from time to time — perhaps a past faced walk with a friend or an occasional aerobics class — but never anything serious. I honestly used to feel sorry for runners. I live in a large metropolitan area that is constantly crawling with runners and fitness types. It’s not uncommon to spot multiple runners on a single, short drive through the city — and just looking at them was enough to stir compassion in my heart. Why on Earth, I wondered, would someone run ON PURPOSE? Because that looks simply awful. But about this time last year, I started experiencing some stress-related health problems including heart palpitations, insomnia and other issues. I finally visited my doctor who promptly recommended I begin a regime of regular medication — such as beta blockers and other meds. I was only 36 years old and this all seemed rather extreme to me. I came home from the appointment and talked with my husband, Dan, who advised that we simply spend some time praying about it before taking any course of action. And the very next week it happened: An out-of-town friend, who knew nothing about my health situation sent me a completely random, unsolicited invitation to join her in running the Savannah Half Marathon with several other ladies. 2. I already have no margin in my life. I don’t have time to exercise. But Dan and I agreed that this was likely the answer to the prayers we’d been offering up. In order to improve my health, I probably needed to exercise. So I dealt with concern #1 (the hating running thing) by starting out very, very slow and working my way up. I ran on a treadmill for over a month before I ever even attempted to run outside. And even then, I alternated running and walking by running 3 minutes then walking 3 (or 5 or 6 or 10) minutes. At first, I continued to hate it. But I stuck with it anyway. And little by little, I grew to enjoy it. I forced myself into training goals by signing up for races of various distances. At first I ran a 5K, then a 10K, then another 10K. My training runs got longer and longer. My pace improved, my endurance improved and, not surprisingly, my health issues disappeared. And there were unexpected bonuses… running gave me time to be alone and to think. It gave me more time to pray. It gave me clarity, energy and more patience with my children. And regarding concern #2… I don’t have time to run. I have 5 small children, I homeschool, I help my husband run a ministry in Africa and my life is constantly a three- ring circus. The truth is that I still don’t have time to run. I never did. I make time to run. It’s like anything else — you prioritize the things that are important. I run early mornings, late nights, in the rain, in the cold, at the gym, on vacation… I’ve even been known to run on an African mission trip. I try to schedule my runs on my calendar at the beginning of every week and then stick to the schedule. For the Savannah Half Marathon, my saving grace was the fact that three friends were signed up to run the race with me. Every time I was tempted to quit, I remembered that they were counting on me to join them for the race, to sweat alongside them and, um, to share the hotel and gas bills. When all else fails, peer pressure will make it happen. And the rest is history. I’ve become a runner. And even if you’re not a runner now, I pray that you’ll sign up to run with the I Run For Cupcakes team this April — and by then you CAN become a runner. If I can do it, anyone can.